Snehagiri Society Mala Thrissur was founded and registered in the year 1979. It is situated about 4 km away from Mala town, registered under Charitable Societies Act, with independent legal status. Snehagiri, which means "Love Hill" is the name of the community they established. Currently about 500 families of the locality which took its name from a nucleus of about 25 families built a housing complex of that name in an area of about 5 acres of land. Rev. Fr. Provincial, Devamatha Province, Trichur is the patron of the Society. Director board of the Society consists of 4 laymen, 1 sister and 4 CMI Fathers. Fr. Jose Payappilly, CMI is the Director of the Society. "SERVICE TO HUMANITY IS SERVICE TO GOD"
Snehagiri Society Mala was founded and registered in the year 1979. Fr. Paul Kodiyan CMI is the founding Director of the Society. He was born at Kuzhoor Panchayat near Mala in Trichur district on 16th November, 1939. Fr. Paul Kodiyan was ordained in 1969. Even prior to his priest hood, he was deeply concerned towards the down-trodden people in the rural areas. As a religious priest he turned his active life into a saga of selfless service. During his pastoral career he devoted his time for the uplift of the poor people. With the peoples participation he helped the poor people for thatching their hutment. He also stressed the need for education of their children. Thus he developed social awareness among them. He also provided training and employment to the poor and unemployed youth of the undeveloped villages of these areas. With the help of the State Government he arranged in setting up of several Child Care Centres for young children under Integrated Child Development Scheme and other socioeconomic & rural development projects, drinking water supply schemes, construction of roads and culverts, small scale industries for training and employment etc. The objectives of the project for the mentally Challenged and Physically Handicapped children are to provide ADL-training and awareness to the parents and community. These children are included in the disability categories of autism, cerebral palsy, mental retardation and multiple disabilities. Snehagiri's Aged home seeks to give solace to at least 75 deserving old people. In this project, we give solace to the deserving isolated and neglected aged people without caste and creed, assuring them of loving care and good nursing. At present, as many as 30 aged people have been sheltered in this Mithralayam Home for Aged. They are provided with meals, refreshments, medical care, entertainment facilities etc. Housing for low and middle income group families was introduced first at Snehagiri Project in 1980. A plot was purchased for this scheme. Houses for the scheme were built by arranging bank loans with low interest. Snehagiri started a Readymade garment unit on 11th October, 1989 with the recognition of Government Khadi Board. The first order was for shirts from a foreign buyer. The consignment was exported through ship. We exported bulk quantities of these garments to Canada and Germany, using raw-material & technology from textile centres like Tirupur. A tailoring centre for women was started in 1979 under the women welfare society called St.Theresa's Vanithakshemam, a charitable society registered specially for women as a sister concern of Snehagiri Society. 75 women were provided with sewing machines. At this centre lot of women learned cutting and tailoring of garments. In the beginning, women got free tailoring machines from social welfare board after completing the course. In 1983 "Snehagiri Tailoring Centre" got Government recognition and it reached a standard of an educational institution. This enabled students to appear for the lower and higher courses of KGTE-TEN which is recognised by the state Government. After the completion of the course students got employment in public as well as private institutions including schools. Many women took ordinary training in tailoring for self employment and are leading a successful life. Later on classes for embroidery, needle work also started. Here admission is for a maximum of 48 students. Special classes are also conducted for ordinary students in morning and afternoons. Concession in fees are also given for poor students. As a part of uplifting the youth, an ITC was started with the affiliation of the Central Government. Here students are provided with trades of Secretarial Practices, Stenography, Beautician. On first of January 1982, Snehagiri Secretarial Institute was established under Snehagiri society. In the beginning there were four English type-writing machines and 18 students. Snehagiri opened a big future for students by charging meager fees. Now typing of different languages are taught here which enabled the students to study according to their taste. This was a blessing for students who go outside Kerala in search of a job. Now more than 100 students are studying here with minimum facilities. It requires more numbers of typewriting and duplicating machines for this purpose. A Computer Training Centre was established at Snehagiri on 11th September, 1993 with the help of 5 computers. 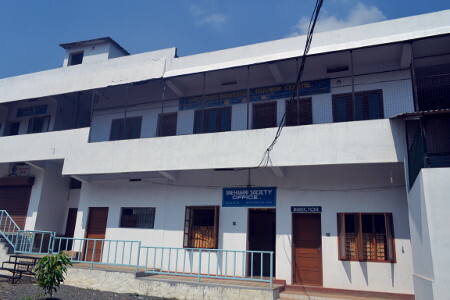 This centre is affiliated to the Indian Computer Education Society of Kochi. Almost 50 students complete the course at Snehagiri Computer Training Centre each year. This computer centre can include software handling and programming. It also plans to introduce provision for speech development and therapy for handicapped persons and people whose speech facility was impaired by accidents or illness. For this purpose they are planning to develop a speech therapy software in Malayalam and other languages which may be too ambitious for the present. A huge amount is required for the fulfillment of this project. The Snehagiri Society Mala always stands for giving better living condition of the natives. For that it seeks any opportunity that gives employment to unemployed. A unit of "Kandankulathy Ayurvedics" is opened in Snehagiri for packing its medicines. It provides job for a number of women. A Khadi weaving unit with 33 looms was started under the State Khadi Board. This provided training and employment to over 50 women. This unit produces Khadi cotton cloth of differed varieties, by hand woven process. As an auxiliary to the main unit Khadi Spinning centre with 50 Charkkas, providing training and employment to 50 women was also established to the weaving unit. For sale of Khadi goods produced by jobless poor women by hand process method, two Khadi Bhavans (Khadi Sales Outlets) were opened, one at Mala and another one at Thrissur. For providing employment opportunities for women on November 14th ,1979 an Umbrella unit was started. In this institution 75 women were given job. Later problems arose regarding funds, place, training etc. Within three months of hard labour, the girls were able to understand all the technical facts involved in making an umbrella. The experts took the role of a quality controller ensuring that the umbrellas made by the ladies were technically perfect by detailed scrutining of the finished product. The Bank of Cochin helped financially. As time passed latest techniques in advertising were introduced by other umbrella manufacturers. This caused a great downfall in marketting our products for past three years. Under the women welfare wing of the society, a separate charitable society named "St. Theresa's Vanithakshemam" was registered in the year 1979. It was exclusively for the welfare of women. Postal address of Snehagiri Society Mala Thrissur: Snehagiri Society, Kuruvilassery Post, Mala, Thrissur District, Kerala, India, Pin - 680 735. Your kind contributions may be sent by DD / Cheque in favour of: The Director, Snehagiri Society at the above postal Address. I came across your organisation whilst researching the possibility of volunteering in India. My husband and I are leaving the UK in March next year to embark upon a ‘Around the world in 800 days’ overland expedition. As well as travelling, we are extremely keen to get involved in local community and education projects in some of the countries we visit. We are both teachers; my husband is an artist who has taught at an art school in the UK and established a collective and gallery to support young artists. I am a biologist and managed a field centre in the UAE, teaching Ecology and Wildlife Conservation. We would like to offer our time for 2-4 weeks; we are willing to help out wherever needed but suggest the possibility of running educational courses or groups in our area or expertise. For myself, I could run a short course(s) on local environment and wildlife (collecting bugs, measuring plants, identifying birds). Andrew could run art workshops which could include drawing, painting, textiles, photography, woodwork and sculpture. India is a country I have travelled in extensively and love it more everytime I visit. We will be travelling by boat from Iran then are planning to spend 2 months in India from Jan to February 2013. Kerala is a particulalry favourite state of mine and we are extremely keen to spend time in rural areas and help out a localcommunity where possible. We have a roof tent on our vehicle and are completely self-sufficient so do not need any support. We are happy to raise money for any materials or equipment we may need.